The Spin-Ball offers appealing multi-sensory stimulation. The different “slices” are in a rainbow of colors to elicit a harmonious feeling, and to develop the ability to differentiate between colors. My daughter has had this toy since she was three months old and at six months still loves it. It’s easy to clutch and the nubbly outside make it fun to mouth. The picture doesn’t do it justice. 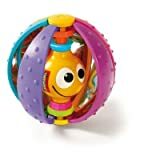 The colored ball pieces move so that there is always a small part open which reveals a littly guy inside who has a smiley face and rotates. The inside of each part of the ball has a mirror finish which makes it visually quite interesting. When the outide pieces move they make a nice clacking sound and there is a rattle in the guy inside. Stimulates senses of touch, hearing and vision as well as curiousity and problem solving. I bought my son a light-up phone that makes hundreds of noises and this yesterday. He has hardly touched the phone and can’t put this “low-fi” toy down. The “slices” have mirror on the inside, it makes a great clicky noise and a rattle in the middle. He can also grip the slices easily. The spin ball is my son’s all time favorite toy! The reflective surfaces inside and the moving pieces and colors, along with the textured outside have made this a favorite for months. Now that my son crawls, it’s a rolling toy he can go after! 2) It eats batteries, although really, I’ve probably changed them only 3 times since we got it several months ago…but it takes 4 C batteries. I like how you can turn off the light/motion and just have the music. My son needs the music to fall asleep, but the light bothers him in the middle of the night. This is super easy to attach to the crib, and I am glad I ended up with this other than the crappy mobile I bought from another company that made horrid noises. I gave it a star because of its style. It is as colorful as described, but that is it! It is very loud even on the lowest seating. Too loud for an infant. Maybe if you keep it outside of the crib, but what’s the point. Plus after a week, the mechanism noise became so loud that I had to stop using it. I also have to mention that I bought two of those for my twins, and both had the same problem. Fortunately Amazon took it back, and refund me. I did not expect such a terrible product from Tiny Love. What a shame!